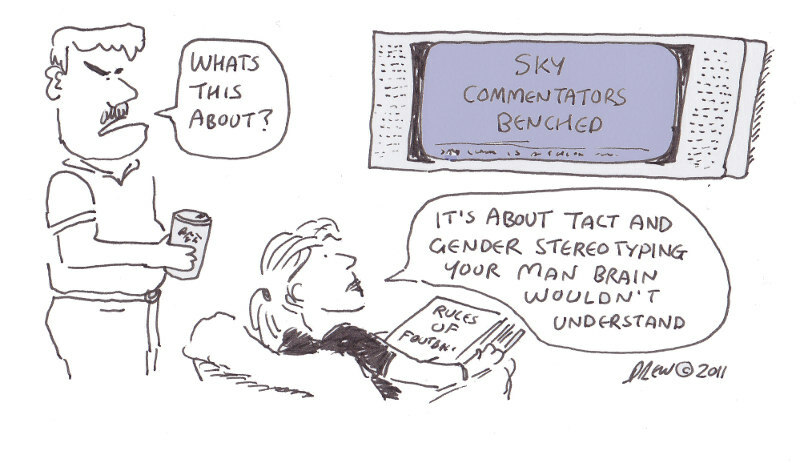 Today's topical cartoon refers to the story about Sky Commentators Andy Gray and Richards Keys comments about women assistant referees not knowing the offside rule. Like Gordon Browns election gaffe the remarks were made when they believed the microphones weren't on. 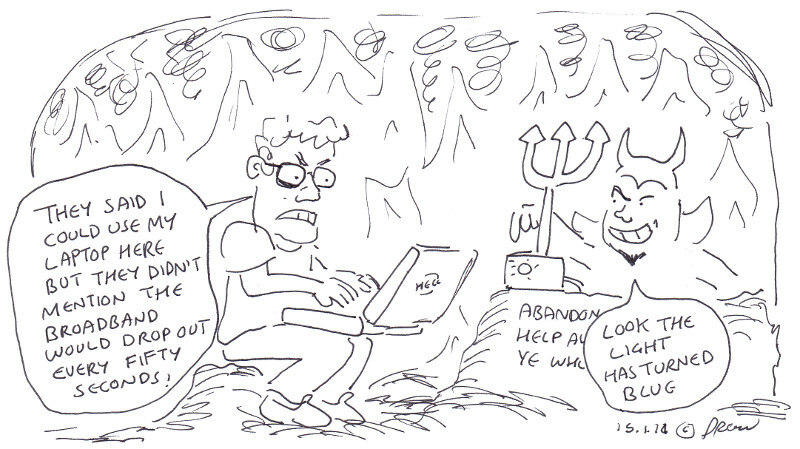 Doing cartoons about topical events is all about having an idea fast while it is still imprinted in the public memory. Too many times its like when someone says something to you and then several hours later you think of a really witty reply but it's too late. To get something like this published (and I'm not sure it would be) I'd had to be maybe a day earlier as by the time tomorrow's papers/editions roll out the 24-hour news bandwagon will have moved onto some other gaffe made by some other celebrity. 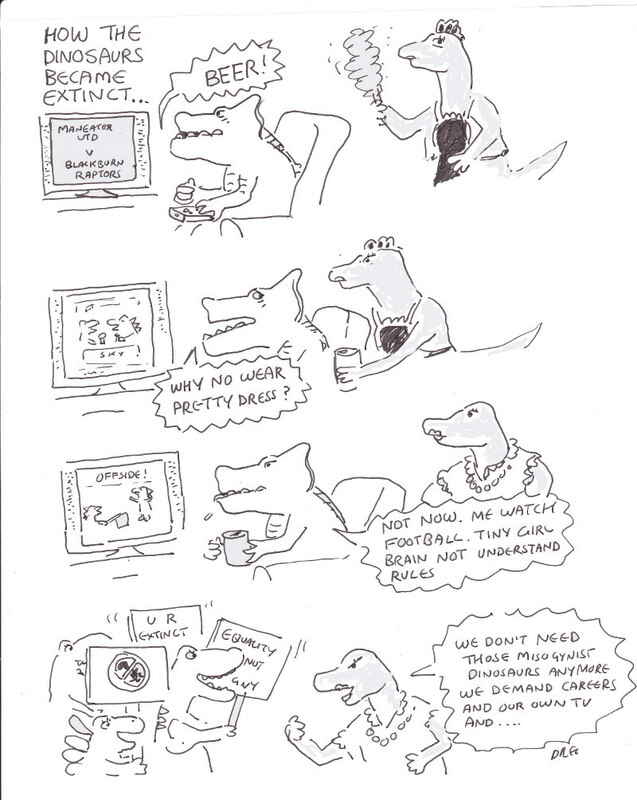 It also reminds me of my only 'published' cartoon which was way back in my University days when I know a guy who helped compile the Hamilton Academical Fanzine who commissioned a cartoon called 'Why Women Don't Play Football'. It would not look very enlightened today but I've made up for it by trying to be sensitive and understand the female response to these totally unacceptable comments. 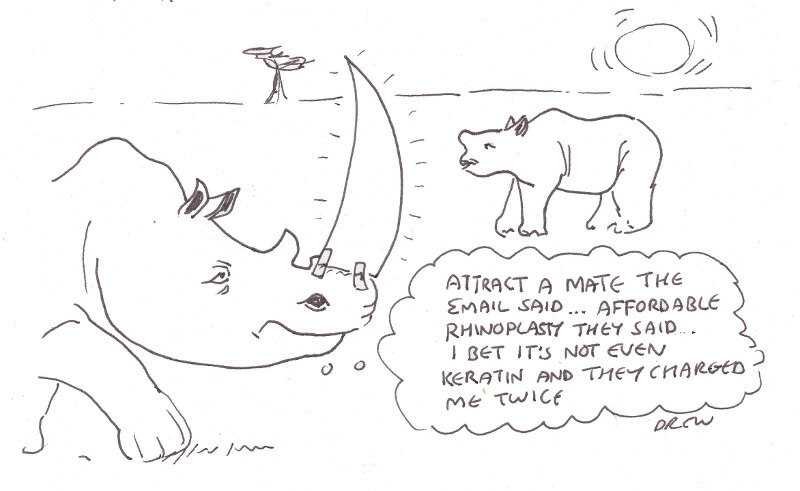 My first post-Septoplasty op cartoon on the subject of Rhinos and Rhinoplasty. Had the operation done in Day Surgery yesterday and nose is still very sore and full of black goo and plastic splints. This cartoon is not an indication I have fully recovered but rather that I need something to distract me from my throbbing rhino (which is the Greek word for Nose). 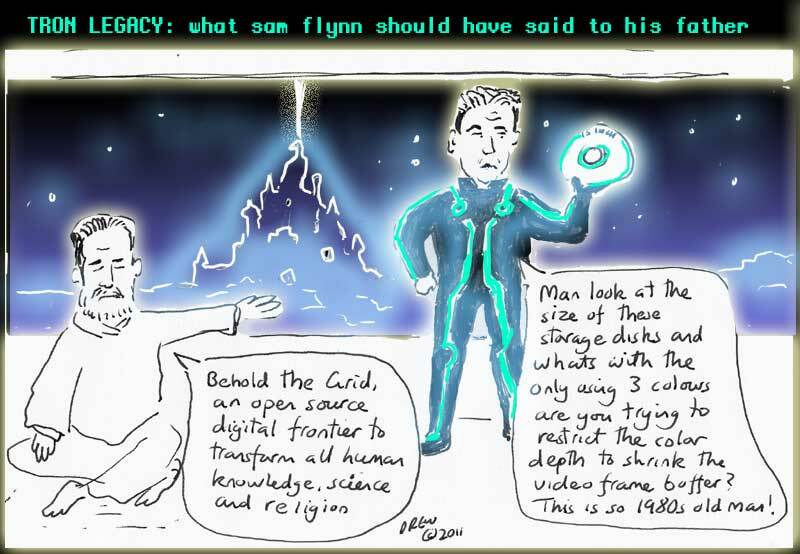 The followup to my previous Tron Legacy cartoon has been delayed due to a lack of broadband at home but here it is. Unusually for a Hollywood/Disney movie Tron Legacy contains no kissing at all which led me to speculate on the ensuing romance between Sam Flynn and Quorra (played by Olivia Wilde of House 'Thirteen' fame). 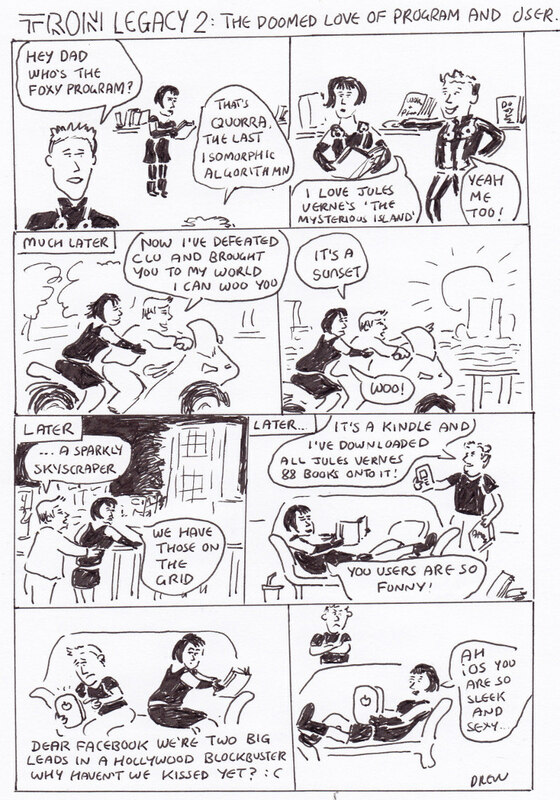 I wasn't sure whether the last panel should reference iPad instead of iOs (the operating system of the iPhone/iTouch/iPad family) but I assumed you are all IT literate and also iOs is an anagram of ISO who are the Isomorphic Algorithmns in Tron Legacy. What I want to know is why Isomorphic Algorithmns which are spontaneous bits of code that just appeared are so good and perfect? When I write code and it does something unintended it is usually stupid or bad. Guess I'm not as perfect as Jeff Bridges. Watched Tron Legacy last night in 3D IMAX and here are my cartoon thoughts on the IT accuracy of it. As a general film it was very entertaining as an accurate depicition of IT I have some plus and minus points. There are a couple of very minor spoilers below so if you haven't seen the film just ignore everything from here on down. su -r root to try and gain access to the most powerful account on the system. - The color pallette of the Grid was about three colours (as mentioned in cartoon) - blue, red/yellow, white. I remember programming the Mac back in the 1990s when I was excited about getting access to 256 colours so why in this new decade has the Grid not got millions of colour options. - Storage Disks - what diameter was everyone's storage disk maybe 20 inches. In the 1970s there were 8 inch disks, making way for floppy 5 1/4 inch disks in the 1980s and then standardising on 3.5 inch disks by the late 1980s. By now we have gigabytes on USB drives so why the need for frisbee sized storage devices that are always falling off and killing people? I have some other thoughts on Tron Legacy that may form another cartoon but if you haven't see it you should go to the cinema and watch it so you understand this post. Happy New Year and the first cartoon for the 2011 is an old idea I had about the marketing genius of calling a cheap product a 'Bag For Life'. Asking shoppers queuing at a checkout who have been caught without a means of transporting goods whether they want to make a commitment to a reusable bag FOR LIFE is extraordinary. Sure you'll say anything to avoid telling the assistant you'd rather DESTROY THE PLANET than pay for a non-plastic carrier. Sure you want to be faithful but how many times do you just forget to bring it along for an impulse buy. In an age of consumerism can you be that sure that sometime when you go to Marks and Spencer or Tesco you aren't going to fall for a prettier or fancier product?